Cheongsams, T-shirts, cameras, tea and dubious antiques: the sidestreets of Chinatown overflow with opportunities to spend your Sing-dollars -- generally with a poor value result. Many shops sell exactly the same goods and the quality is so-so, but the price is always right. Small souvenirs like magnets are 5 for $5 and you can get a "real silk" (as in, not real) robe for under $10. This is a very heavily touristed area and is awash with tailors promising a shirt in six hours and other hawkers selling, well, mostly plastic rubbish -- but if you need a one stop shop to buy small gifts for your extended family back home (I love Singapore fridge magnet anyone? 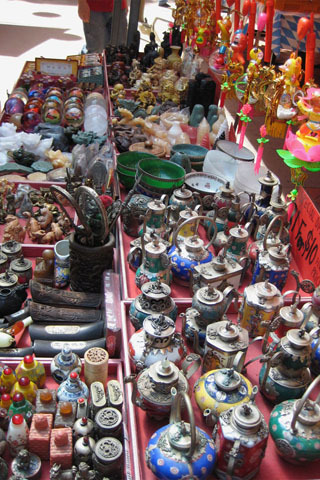 ), the street markets of Chinatown work. Souvenir shops aside there are also quite a few food stalls and restaurants. As with the souvenirs, buyer beware -- in particular durian can be fantastically overpriced here, but if you just want some grazing, you could do worse and it is a great opportunity to try Chinatown favourites like dim sum and bak kwa (sweet pork jerky). The market is bustling with activity from morning to night and explodes with decorations in the months leading up to Chinese New Year.